1. Wash and snap off ends of fresh beans. Cut or snap into 1- to 2-inch pieces. 2. Blanch 3 minutes and cool immediately. 3. Rinse kidney beans with tap water and drain again. 4. Prepare and measure all other vegetables. 5. Combine vinegar, lemon juice, sugar, and water and bring to a boil. Remove from heat. 6. Add oil and salt and mix well. 7. 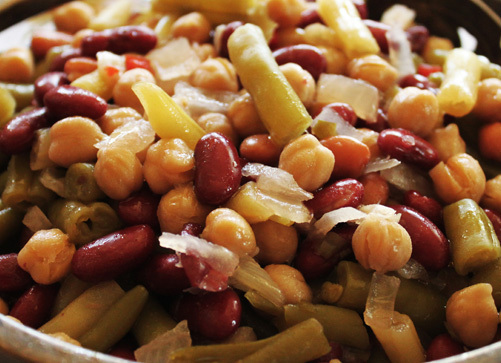 Add beans, onions, celery, and green pepper to solution and bring to a simmer. 8. Marinate 12 to 14 hours in refrigerator, then heat entire mixture to a boil. 9. Wash and rinse canning jars; keep hot until ready to use. Prepare lids according to manufacturer's directions. 10. Fill clean jars with solids. Add hot liquid, leaving 1/2-inch headspace. 12. Adjust lids and process jars immediately in a boiling water canner according to the recommendations. 13. Let cool, undisturbed, 12-24 hours and check for seals.